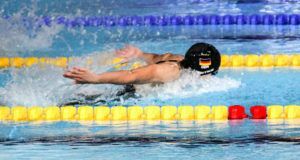 Dutch National Record holder Kira Toussaint put up a solid performance in her first swim back after having been cleared of a doping test debacle, taking the top seed of the morning in the women’s 100m backstroke. Competing here in Marseille at the FFN Golden Tour Camille Muffat, the former Tennessee Volunteer clocked the only sub-minute time of the morning, earning lane 4 in 59.82. That’s Toussaint’s fastest mark of the season and places the 24-year-old as #5 among the world rankings. 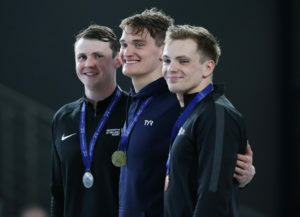 Another notable performance came from Great Britain’s Ben Proud, as the 50m fly world champion clocked 22.34 to take the top seed ahead of Toussaint’s Dutch teammate Jesse Puts in the men’s 50m freestyle. 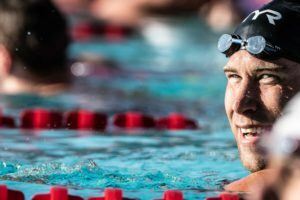 Proud crushed the fastest time in the world his season with the 21.71 he threw down in Luxembourg this past January, so it’s very possible we could see a sub-22 from the Energy Standard swimmer tonight. Frenchman Clement Mignon lurks as the 3rd seed in 22.47, while Algeria’s Mediterranean Games champion Oussama Sahnoune also made the final in 22.82. Iron Lady Katinka Hosszu was among the women’s 400m IMers in the heats, earning a morning warm-up time of 4:34.79. That’s a big swim from the Hungarian, whose season-best thus far was the 4:38.92 put up in January. The 400m freestyle leaders were Aussie Maddie Gough and Spaniard Mireia Belmonte. Gough touched in 4:14.80, while Belmonte took the 2nd seed in 4:16.24. Both outings represent the women’s top times so far this season. Belarusian Ilya Shymanovich took the top spot in the men’s 50m breast in 27.03. His country mate Alina Zmushka did the same for the women, beating the pack in 31.28. Maaike De Waard and Kim Busch tied in the women’s 50m fly, each collecting a morning mar kof 26.40. South Africa’s Chad Le Clos was in the water, earning the only sub-2:00 effort in the men’s 200m fly in 1:58.36. Hungary’s David Verraszto claimed lane 4 in the men’s 200m IM,, producing 2:01.41. France’s Maxence Orange was the fastest 100m backstroke for the men, touching in 54.28 for the pole position. Wonder how many times LeClos looked around when he was the top seed by so much? Scrolling the results, 4.34.79 was swum by Katinka Hosszu in the 400 Im not 400 free and, obviously, was the huge best time in the 400 Im..; if this is true is a great performance not a warm-up tie well off the leaders..
There’s at least another remarkable result in the morning heats: 1.01.03 swum by 15 year-old Anastasia Gorbenko improved her recent PB and NR in the 100 back. And that after a 4.47 in the 400 Im (third position in heats lead by Hosszu with 4.34).